All too often, when people hear the word alignment, they respond with a throaty gulp and a momentarily look like a deer caught in the headlights. Their response may be something like, "I want my practice to be spiritual. I don't want to be in my head or focused on analytical stuff!" No doubt, it has been an uphill battle convincing people that alignment in yoga asana is vital and is indeed, a deeply, spiritual experience. But wait—I don't want to lose you! If you're getting ready to tap your mouse and saying, "Enough of this!” just hang in there for what hopefully will be a new perspective on yoga practice. Alignment is not static, rigid, or locked in place. Instead, alignment provides more fluidity and flexibility, and increases muscular strength and efficiency. Alignment allows yoga practice to progress with refinement, elegance, and most importantly, with safety. Alignment is the essential language between the body and mind. It’s how they communicate and work together in harmony. Spirit is the expression of this harmony. Alignment follows the Raja principles found in the ancient yoga texts. Alignment brings wisdom to every asana. It doesn’t steal flexibility from one joint or region to compensate for another. Alignment promotes efficiency by not expending needless energy. And most importantly, it does not let our practice cause harm to our bodies. Instead of fruitlessly attempting to master specific alignment rules for each of the 8.4 million postures, instead, there is only one system of alignment to follow. The one alignment template to apply is the natural posture of the human body, which is fully expressed in Tadasana, the Mountain Pose. All other yoga asana are merely expressions of Tadasana! And yes, not every person will look the same. It’s not the final appearance of a pose that matters. It is the intention of the direction; the movement and action we always take energetically that preserves Tadasana in every pose. This idea that we are always the same, fully actualized being and that all humans strive for the same return to our most basic self – well, this is the deepest expression of spirit in physical form. Here is a good start for bringing awareness to the mat and to practically everything else we do. Presented here in simplest terms, these ideas may sound ridiculously easy and intuitive, however, most of us fail to do use them. When these principles are presented to beginner classes, they appear as seasoned yogis, far more advanced than the time they’ve spent on the mat. When advance practitioners use them, they go deeper into poses with less effort and strain. The chest is in front, and the shoulders are in back. The arms align with the shoulders, not the chest. Easy, right? Test this tip when performing revolved postures, and in Warrior and Triangle Poses. You’ll see the tendency is for the shoulders to roll forward, the chest to collapse, and the arms bones to align with the chest. Observe this relationship between your chest and shoulders, and your postures will transform immediately! 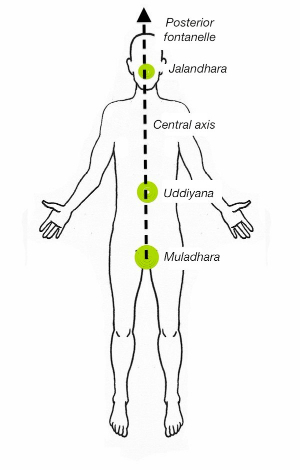 The body’s central axis is aligned when the bandhas and diaphragms are in line with each other, either vertically or horizontally. The bandhas (energy locks) and the diaphragms function together; the diaphragms being physical and the bandhas more esoteric. Align the bandhas vertically in standing and sitting poses; align them horizontally in supine poses. The bandhas correspond to diaphragms in the body. When a diaphragm is engaged, it lifts from its center, forming a dome-like shape. This is the action of the bandhas. The diaphragms include the pelvic floor, the thoracic diaphragm and the soft palate (roof of the mouth). They all align and energetically exit the rear soft spot, or the posterior fontanelle of the skull. 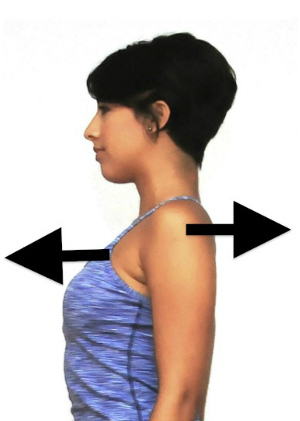 Use the action of engaging the bandhas to bring each diaphragm directly in line with the one below. Aligning the central axis in this way maintains the integrity of our core, physically and energetically. There is nothing in between. Since our asana are always moving slightly further into the pose, only one direction brings into a more refined and more therapeutic position. Movements that take us out of alignment are dangerous and cause injury. Some people like to call this Trauma-yama! The basic question we need to be asking ourselves is, “Do I know the direction to move each part of my body in every moment?” If your answer is not an emphatic “YES!”, then you have to take a hard look at what your yoga practice is actually doing!